What's your flavour? Dry off all summer long with The Pepperoni Pizza Towel! What’s your flavour? Dry off all summer long with The Pepperoni Pizza Towel! 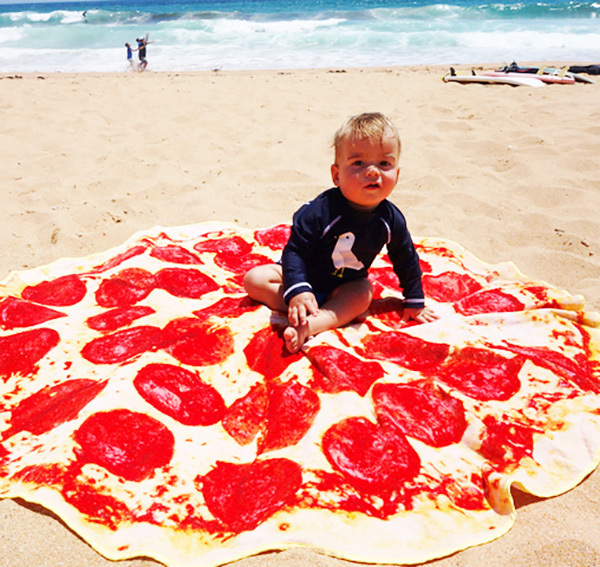 Margherita, Pepperoni, Hawaiian, Supreme or Meat Lovers – no matter your topping of choice, if pizza is you thing, you’re going to want to tell everyone about your undying love with a pizza towel this summer. A brilliant novelty item for the pizza fanatic in your life, The Pepperoni Pizza Towel is the must-have fun accessory to sport this summer. Made from pure cotton and spanning a huge 1.5 metre diameter, you’ll have no trouble wrapping yourself in the pepperoni print to dry off. Head to PizzaTowels.com to place your pizza towel order. The Pepperoni Pizza Towel is priced $69.95 and comes gift boxed in (you guessed it) a pizza box – we can only hope a garlic bread beach pillow will be launched soon! If pizza’s not enough, browse our archives for more almost-edible nursery and decor delights, including delicious doughnut pillows and burger bean bags.